Carnival Splendor is the sole ship of the Splendor class, a smaller, modified version of the Concordia-class cruise ship, operated by Costa. She entered service on 2 July 2008. At 113,323 GT, she was the largest ship in Carnival Cruise Line until Carnival Dream debuted in September 2009. Carnival Splendor is widely known for the November 2010 incident in which a fire started in the engine room, shutting down all electrical power to the ship. The ship was originally designed and ordered for Costa Cruises but she was transferred to Carnival Cruise Lines during construction. The ship is scheduled to undergo a dry dock in November 2019. Carnival Splendor's godmother is Myleene Klass, who on 10 July 2008 christened the vessel in Dover in a lighthearted ceremony where she played Sailing on the piano, while a Royal Navy diver climbed up five decks on a rope, and broke the bottle of champagne on the bow by hand. Carnival Splendor's inaugural season began on 2 July 2008 with a cruise from Genoa, Italy to Dover, England, followed by cruises to Northern European ports. On 3 November 2008 she transitted to Fort Lauderdale, Florida. In January 2009, Carnival Splendor moved to Long Beach, California, a journey which took 49 days. The ship was too wide for the Panama Canal at the time, so it made the journey by sailing around Cape Horn. It was the first Carnival ship to have ever made this voyage. From Long Beach, she sailed year-round cruises to Mexico. In March 2009, Carnival Splendor was the host ship for Mayercraft Carrier 2, a four-day cruise from 27 to 31 March, from Los Angeles to Cabo San Lucas, Mexico hosted by musician John Mayer and featuring music and comedy shows. In February 2013, Carnival Splendor sailed again around South America, repositioning to New York City to cruise to the Caribbean and Bermuda. In November 2014, Carnival Splendor was re-positioned to Florida to offer seasonal seven-day cruises to the Eastern and Western Caribbean. In March 2014, Carnival announced the Carnival Splendor would sail seasonally out of Norfolk, Virginia before heading back to New York beginning in 2015. In October 2015, Carnival announced that the Splendor will be re-positioned to China in 2018 offering year-round short cruises. However, Carnival subsequently announced in November 2016 that Splendor will instead relocate to Long Beach for the second time in January 2018, offering cruises to the Mexican Riviera. To move to Long Beach from the Caribbean, she would sail through the Panama Canal and will become one of the largest ships to ever cross through the new locks. On 7 February 2018, Carnival Cruise Line announced Carnival Splendor will come to Sydney Harbour in December 2019, to operate year-round down under. On 8 November 2010, at approximately 06:00 Pacific time, on the second day of a voyage from Long Beach to the Mexican Riviera, the ship experienced a catastrophic failure of the #5 diesel generator which started a fire in her aft engine room. The fire spread to the overhead electrical cable runs in the aft engine room. The fire in the cable runs caused extensive damage to the cabling and contributed to the ship losing all electrical power. According to Carnival president, Gerry Cahill, a "crankcase split, and that's what caused the fire", adding it was isolated to the aft generator room. The fire was extinguished by the afternoon, and no one was injured. Nearly 4,500 passengers and crew members were on board at the time. The crew was unable to restore power to the engines, and the ship was towed by tugboat to San Diego. Without power for air conditioning and refrigeration, passengers were fed rations delivered via U.S. Navy helicopters from the aircraft carrier USS Ronald Reagan. Splendor was escorted by, and received aid and security assistance from the U.S. Coast Guard Cutter Morgenthau. Carnival Splendor arrived in San Diego under tow around sunrise on 11 November, and docked around noon. Carnival promised to refund all passengers for ticket and travel expenses along with a voucher for a free cruise of equal value to their cruise on Splendor. The ship has three 12-cylinder Wärtsilä 12V46C medium-speed diesel generating sets in the aft engine room and three in a forward engine room. Each generator is connected to two switchboards. The failure of a single engine or generator should not normally cause a total power loss. Clark Dodge, former chief engineer for Washington State Ferries, said, "If things were designed properly, all the power shouldn't have gone out." The investigation into the fire was carried out by the United States Coast Guard in conjunction with the Panamanian Maritime Authority. The report into the cause of the fire was released on July 15, 2013. On 23 February 2012, while in Puerto Vallarta port, Mexico, 22 passengers on the Carnival-organized "City and Jungle Tour" were robbed by an armed bandit. Passengers lost money, cameras, purses, passports, other documents and valuables. No shots were fired and everybody escaped without injuries. On March 2, 2017 while 50 miles outside Puerto Rico the ship experienced engine trouble requiring operation on a single engine. Carnival canceled the remaining portion of the cruise and returned to Miami. Carnival offered a 50% refund off the cost of the cruise, free internet use for the remainder of the voyage, and a 50% discount off a future cruise. ^ "Carnival Splendor Launched at Genova" (Press release). Fincantieri. 3 August 2007. Retrieved 11 November 2010. ^ "Carnival takes delivery of new vessel". Breaking Travel News. 30 June 2008. Retrieved 11 November 2010. ^ "Carnival Splendor Ship Facts". Carnival. 2010. Retrieved 11 November 2010. ^ a b "Advanced Masterdata for the Vessel Carnival Splendor". VesselTracker. 2010. Retrieved 11 November 2010. ^ a b Carnival Splendor perplexes engine room safety experts. AMEM Communication, December 2010. Retrieved 2013-07-28. ^ a b "Carnival Splendor (9333163)". Equasis. French Ministry for Transport. Retrieved 14 January 2012. ^ "Carnival Names New 112,000-Ton Cruise Ship Carnival Splendor" (Press release). Carnival Cruise Lines. 2 February 2006. Archived from the original on 27 September 2007. Retrieved 13 November 2010. ^ "Carnival Cruise Line's Cruise Ship Dry Dock Schedule and Upgrades". cruisefever.net. Retrieved 10 August 2018. ^ Gene Sloan (10 July 2008). "British entertainer christens Carnival Splendor in England". USA Today. Retrieved 10 November 2010. ^ Steve Read (14 June 2008). "Singer Myleene Klass will launch the biggest cruise ship ever to sail from Dover next month". The Sun. London. Retrieved 10 November 2010. ^ Mylene Klass officially names Carnival Splendor (video). YouTube. 10 July 2008. Retrieved 11 November 2010. ^ "New 113,300-ton Carnival Splendor To Operate Line's First-Ever South America Voyages Beginning in January 2009" (Press release). Carnival Cruise Lines. 10 May 2007. Archived from the original on 20 February 2008. Retrieved 13 November 2010. ^ "New 113,300-ton Carnival Splendor To Operate Line's First-Ever South America Voyages Beginning in January 2009" (Press release). Carnival Cruise Lines. 2 July 2006. Archived from the original on 7 June 2008. Retrieved 13 November 2010. ^ Mayercraft Carrier 2 to set sail with John Mayer, Guster[permanent dead link], news.jamradio.org, 18 June 2008. Retrieved 18 June 2008. ^ Sloan, Gene (9 February 2012). "Carnival Cruise Lines to expand capacity in New York". USA Today. ^ "Carnival Cruise Line To Dedicate Two Ships To Chinese Market; Carnival Miracle To Begin Service In 2017 And Carnival Splendor In 2018". Carnival Cruise Lines. Retrieved 28 October 2015. ^ "Carnival-to-offer-sailing-through-new-Panama-Canal-locks/". USA TODAY. Retrieved 4 November 2016. ^ "Carnival Cruise Line News". carnival-news.com. Retrieved 30 January 2018. ^ Staff, CIN (6 February 2018). "Carnival Splendor to Move to Australia Year-Round". Retrieved 9 February 2018. ^ "Document: Coast Guard Report on 2010 Carnival Splendor Incident - USNI News". USNI News. 16 July 2013. Retrieved 28 April 2017. ^ Longbottom, Wil (10 November 2010). "'It smells like people are throwing up': Passengers on board stricken Carnival Splendor speak about cruise liner 'nightmare'". Daily Mail. London. Retrieved 10 November 2010. ^ Vercammen, Paul (11 November 2010). "Another tugboat helps tow crippled cruise ship; passengers welcome aid". CNN. ^ Spagat, Elliot; Watson, Julie (9 November 2010). "Passengers await help on crippled cruise ship". The San Francisco Chronicle. Retrieved 10 November 2010. ^ La Ganga, Maria L.; Perry, Tony (10 November 2010). "Stranded Cruise Ship Offers Lesson in Huge Vessels' Vulnerabilities". The Los Angeles Times. Retrieved 10 November 2010. ^ Young, Stephanie (10 November 2010). "Coast Guard response to Carnival Splendor continues". United States Coast Guard. Retrieved 11 November 2010. ^ Spagat, Elliot; Watson, Julie (11 November 2010). "Last passengers leave 'nightmare' cruise ship". MSNBC. Retrieved 12 November 2010. ^ Fuller, Elizabeth (10 November 2010). "Carnival Splendor fire: How do you compensate unhappy clients?". The Christian Science Monitor. Retrieved 11 November 2010. ^ "Spam, Slow Tow Home for 4,500 on Disabled Ship". CBS News. 10 November 2010. Retrieved 11 November 2010. ^ a b Gary Stoller (12 November 2010). "Carnival Splendor stranding baffles marine experts". USA Today. Retrieved 10 November 2010. ^ "Design flaw may have stranded cruise ship". UPI.com. United Press International. 12 November 2010. Retrieved 17 November 2010. ^ "Carnival Splendor Fire Explained By Coast Guard Report". Gadling. 16 July 2013. Retrieved 28 April 2017. ^ "Cruise line: 22 passengers robbed in Mexican seaside resort". CNN. 27 February 2012. ^ Lin, Rong-Gong (26 February 2012). "22 Carnival Splendor cruise ship passengers robbed in Mexico". Los Angeles Times. ^ "Carnival Splendor Slowly Returning To Miami After Technical Issue". CBS. 3 March 2017. 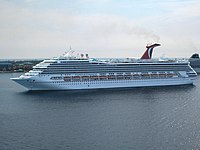 Wikimedia Commons has media related to Carnival Splendor. This page was last edited on 14 January 2019, at 02:27 (UTC).